These vintage classic, perfectly seamed thigh highs with a Cuban heel will add a little something to everything you wear. The Kix'ies Thigh High Tights are all about Fashion, Fun and Freedom and they are just as comfortable at work or play. The strong but gentle silicon-grip band keeps them in place. And, best of all, they're built to last. No matter their size, shape or age, every woman deserves to feel comfortable and have fun, these are not your standard one size fits most style tigh Highs. We know that not every body is created the same, so we created 4 sizes to fit all shapes and ensure a "stay-up fit." No one likes how regular tights put the squeeze on you. And who doesn't breathe a huge sigh of relief when they are peeled off after a long day? 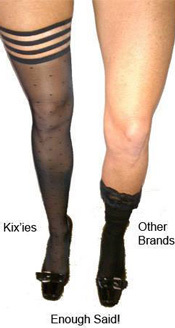 Kix'ies free you from the "tights that bind." So kick your bulky, unflattering tights to the curb and fall in love with Kix'ies. Kix'ies come in six styles. Size B: Height: 5'5"-6'0"; Thigh Circumference: Up to 25"; Weight: 125-170 lbs. Size C: Height: 4'11"-5'5"; Thigh Circumference: Up to 30"; Weight: 140-240 lbs. Size D: Height: 5'5"-6'0'; Thigh Circumference: Up to 35"; Weight: 170-260 lbs. Tip: Measure by height first and your weight second. We all carry our weight differently; be in your tummy, tush or thighs. With thigh highs you need only be concerned with height and thigh size when finding the right fit for you and your body.